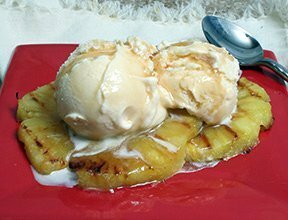 Here's a summer-inspired pineapple dessert recipe that's certain to be a crowd pleaser. It would be difficult to find anything to top this excellent dessert featuring grilled glazed pineapple slices served with homemade vanilla ice cream and a generous amount of maple syrup. Let us show you how easy it is to grill pineapple rings for a special sweet grilled treat. See how to grill Zucchini slices for a perfect side to any summer meal. Your family is sure to enjoy this grilled side dish.